I will be the first to admit that as a twenty-something renting in the city, I’m in no position (nor do I have much desire) to own a house or a condo in the near future. However, I am not immune to dealing with real estate agents – even as a renter. This past month, I set up multiple appointments to see both apartments and condos listed for rent as my lease was coming to an end and I was eager to relocate to more convenient neighborhood. Most apartment viewings I dealt directly with landlords. Condos, on the other hand, were represented almost entirely by real estate agents brokering the deal. What I quickly came to realize after a flurry of viewing appointments, an inbox full of urgent emails and many stress induced headaches, was that real estate agents were feeding me a lot of bullsh*t to get me to sign on the dotted line. The sooner they rented the unit, the sooner they received their cut (typically a month’s worth of rent paid by the condo owner). There was one condo in particular where I reached out to three different real estate agent's with the exact same question about the exact same unit. I got three completely different answers. The building of was no help either. To this day, I’m not sure who was lying and who – if any – were honest. Needless to say, I did not move into that condo building over this situation. Now this was obviously annoying to me as a renter, but imagine being the owner of a condo and having multiple listing agents misinforming your potential tenants of your renting requirements and rules just so they can get the deal pushed through faster. Though listing your condo and showing people yourself may seem like a hassle, would it not be far better than entering a legal contract with a misinformed tenant? Just a thought. Maybe you think that a real estate agent’s relationship with a tenant and landlord is much different than that with a buyer. But what if it’s not? How can you be sure that you’re being told the truth, or being told what you want to hear? 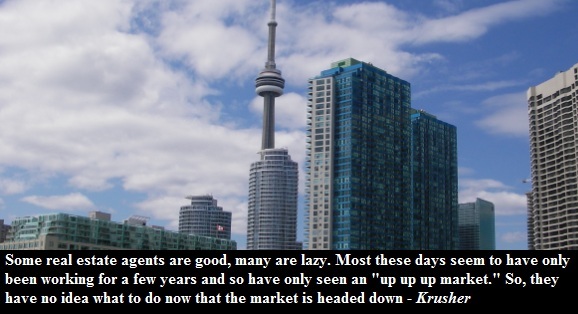 There’s this common, unquestioned belief that many Canadians have – that an increase in housing prices is a good thing and that buying a home or condo is an investment. Now, if you’ve been reading this blog, you know that’s not necessarily true. But something that isn’t discussed as often is real estate agent's and their blatant conflict of interest – especially considering the current market conditions. Look at the current bubble we’re in. As prices increased, real estate agent commissions, well, they grew too. But hey - let’s be honest, if you were a real estate agent what would you rather be paid? 5% of the constant value of a home, or 5% of the ever growing value of a home? Exactly. If you’re selling, that conflict of interest may not concern you at all. You want to sell at the highest price possible, as does your real estate agent. That’s logical – there’s a natural alignment of both parties’ interest. But what if you’re a buyer? Most people sell so they can buy elsewhere. How can you be sure that your real estate agent is really on your side and negotiating a fair deal for you? Real estate agents want to make the sale. They are making money, not parting with it as you are. It’s in their interest for you to buy at a higher price. Of course, deep down, you knew that already. But why aren’t more people questioning this? One last question worth asking: will a real estate agent ever tell you not to buy or sell? In light of the current real estate market, this question is a very important one. I would wager that the majority of real estate agents would never advise you not to buy or sell even if the market was not in your favor. Perhaps there are a few honest ones, but if they’re turning away your business, you’re left questioning their business sense, are you not? In addition to my fulltime job, I do some freelance work online for some extra cash. I have been asked not once, not twice, but five times by five different real estate agents to fabricate positive reviews on Zillow and other real estate sites for money. While fake online reviews are much more common than most people realize, the fact that real estate agents have no problem buying good feedback should be concerning to you, especially if you’re paying them a hefty 5% commission fee. What’s even more concerning is that four of these five real estate agents had a minimum of 10 positive reviews on their site of choice already. Let’s be realistic here - if they have ten real reviews, why would they buy the eleventh? This post isn’t meant to condemn real estate agents – as I do not believe that real estate agents are inherently evil. They’re making a living (some more honestly than others). Whether you’re a buyer, seller, tenant or landlord, you need to be rational and not so reliant on real estate agents. Question, research and think for yourself. real estate agents make money when you buy and sell real estate. However, if you’re not careful, you can lose money in the process.